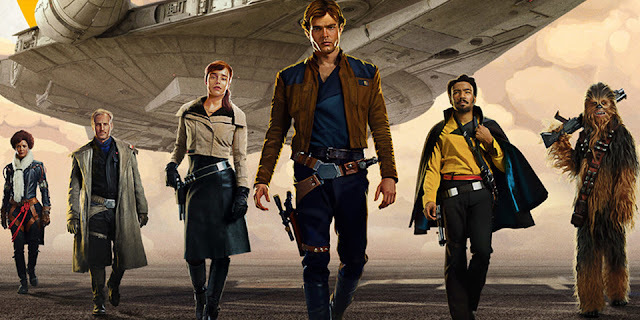 Solo is the movie I didn't want. I generally dislike prequels as there's generally no real risk to the characters. In this movie, we know Han Solo, Chewie and Lando live. No great surprise there, so how does one make a prequel movie featuring some of the most iconic characters of all time? It can be quite difficult to get it right. Well for a start, they can't go the Rogue One route where EVERYBODY dies so they have to rely on a convincing story that matches the original Han Solo movies and show plenty of 'new' Star Wars. So colour me Correlian, Solo delivers a story and 'new' Star Wars in spades. A slow start featuring a chase which looks as dull on the screen as it did in the trailer serves as a nice set up for the relationship between Qi'ra and Han which sets up the whole shebang. And from then on, it's a rockin' good time with robots, card cames, double crosses and space ships doing what spaceships do. What of Alden Ehrenreich's Han Solo? He's fine, he's fine. We're fine, everything's fine. Han Solo is one of THEE archetype film heroes that comes along every so often. There's almost no way Ehrenreich can live up to any one's expectations as Han Solo. It's almost unfair and it probably is. But once you let the movie get into its stride, you can simply forget that, and enjoy the movie for what it is, a space romp across the galaxy far away. Alden delivers his lines superbly well and when asked to do some action, he deft plays the part of bourgeoning space rouge. There's a great bit at the end when he does a Harrison Ford hand gesture combined with the blink of an eye and it is just perfect Han Solo. Donald Glover's version of Lando will go down in history as one of the great character actor replacements. Sure there have been some standout replacement versions of James Bond a la PierceBrosnan, it was a masterstroke to cast Glover. He embodies the character with the "Hello, what have we here?" charm that Billie Dee Williams. He does it as though he knows he's in on the joke that the rest of the film doesn't know it's in. That may sound unfair to the movie but if we compared directly to Alden's Han, he's playing it as close as Han Solo as he can get. Glover is Lando and gosh, I hope we see that guy again. This movie is Joonas Suatamo's second full outing as Chewbacca, and while he has some fun moments with Porgs in The Last Jedi and did the heavy lifting for Peter Mayhew in The Force Awakens, this film is Chewie's chance to emote like he never has before. Sure, there's been some great Han and Chewie moments in prior movies, but for this movie, it feels different. Perhaps it's the new actors but it feels like a spark has been rekindled. If anything, this movie is the tale of how Han and Chewie became firm friends. Where The Last Jedi strayed into teenage angst territory, Solo is argaubly one one of the closet films made in the same vein as A New Hope. Sure, it's a bit of a caper movie and there are no Jedi but there might be the odd Sith lurking around, so much so things are kept interesting. Beckett and Qi'ra are strong, solid characters. Indeed as a big Game of Throne fan who cannot stand the acting of Emilia Clarke (check out her turn on the last Terminator, case closed your honour), this turn should be considered a career highlight. Lawrence and Jon have done some great fan service too. This is plenty of reference to the past films. If I had one gripe, it's that we didn't need the giant space octopus.